The Early Bird Catches the Free Spins! 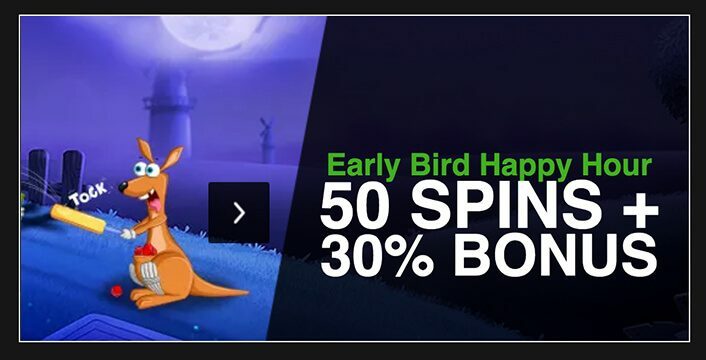 Enjoy The Roo Casino Early Bird Special And Get Free Spins Now! Get daily free spins at Roo Casino during the Early Bird Happy Hour. Along with the free spins, there is a match deposit bonus that increases the amount you have to play with. This is a great way to start off your gaming experience for the day. Boost your bankroll now with a match deposit bonus offer and much more. Who doesn't love kicking off their weekend with free spins? The Happy Hour promotional offers take place between 9:00am and 10:00am Australian EST. Deposit a minimum amount of $25 at Roo Casino, and redeem the Early Bird Happy Hour free spins. You get 50 free spins on the Fire & Steel pokie from Betsoft. For a deposit of $50 or more, enjoy a 30% match deposit bonus offer up to a maximum of $100. You may use one or both of these Early Bird Happy Hour offers. Claim these offers from the My Promotions section of the Roo Casino site. The promotion is only open to real money Roo Casino players . You need to have made a minimum of one successful deposit at Roo Casino before the beginning of the promotion. The Early Bird Happy Hour begins at 9:00am and ends at 10:00am AEST. Make the minimum deposit amounts to be eligible for each of these offers. You may claim one or both of these offers every day. Claim each offer only once on any given day during the promotional period. Free spins winnings come with a 20x wagering requirement. Match deposit bonus winnings come with a 20x play through requirement. This requirement is for both the deposit amount and bonus amount. You cannot combine these promotions with other promotions. If you have a pending withdrawal from Roo Casino, you cannot get any other bonuses until it is complete. Play the Early Bird Happy Hour free spins on the Fire & Steel pokie from Betsoft. This popular game has reels shaped in a diamond formation with 3-4-5-4-3 rows across the reels. Fire & Steel has 20 pay lines. The game has excellent graphics and animations that bring alive the fantasy theme. Keep an eye open for the Shieldmaiden and the Swordsman, both important symbols on the reels. War of the Wilds: When the Shieldmaiden and the Swordsman appear on the reels, they both shoot off light beams. Where the light beams meet, the War of the Wilds begins, launching 10 free spins. The spot where the wild beams intersected changes into a sticky wild that remains throughout the free spins feature. The Shieldmaiden and the Swordsman appear with greater frequency during the free spins round. Once again, their beams of light intersect, turning another symbol into a sticky wild, along with triggering more free spins. Wild Shieldmaiden and Swordsman: When these symbols appear alone on the reels, they still send off a beam of light power. The Swordsman’s beam of light is vertical, traveling either to the left or the right. The Shieldmaiden’s beam of light is horizontal either to the left or to the right. When the beams of light power touch the symbols on the reels, they become wilds. The wilds may increase wins and form additional payouts. Diamond-Shaped Reels: The diamond-shaped reel layout adds interest to the game. This layout also increases the winning possibilities. Both Ways Pay: While most online pokies pay only one way, the Fire & Steel game pays both left to right and right to left. This allows for a greater number of winning combinations. Play Fire & Steel on your desktop computer, or your laptop computer, and on mobile devices. Betsoft used the HTML5 technology when creating the Fire & Steel pokie. This technology helps create smooth, high definition graphics and animations while maintaining the smaller file sizes necessary for mobile play. 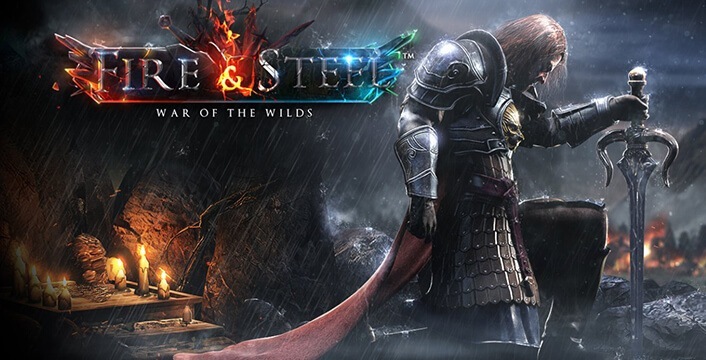 This means you can play Fire & Steel across almost all mobile devices including Android, iOS, and WinPhone choices. New players at Roo Casino enjoy a special Welcome Bonus. This offer awards new players with a 200% match deposit bonus up to a maximum of $5,000. This promotion is only available for newly registered account holders. You must be 18 years of age to sign up with Roo Casino. Make a minimum deposit of $20 for the 200% match bonus offer. The bonus offer tops off at $5,000. Fulfill the 20x wagering requirement on both the deposit and bonus amounts. The offer is only for your first deposit at Roo.